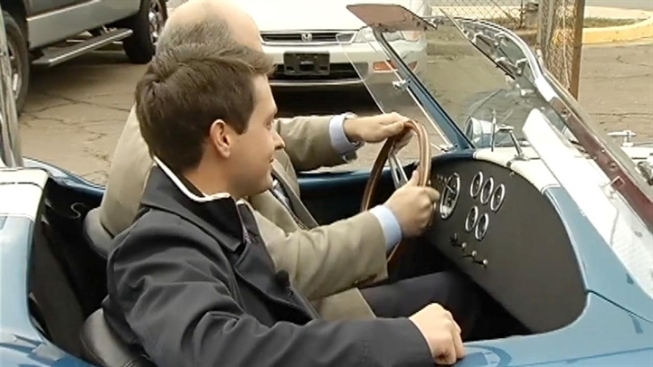 Fairfax County automotive students are getting the chance to pop the hood of a classic car. This week an anonymous donor handed over the keys of a 1965 Shelby Cobra kit car to the students and staff of Robinson Secondary School in Fairfax, Va.
"You can work in a classroom and you can learn everything about a car through textbook, but until you really work with your hands that, at least for me, is when I really understand how a car is working," Senior Caleb Peck said. "It's special for us," said Chad Maclin, who helps run the county's automotive technology program. "It shows how the community gives back to the school system." Maclin is thankful his students have quality donations to work with in school. The newly donated Shelby Cobra is appraised for about $45,000, he said. There are 13 automotive technology programs throughout Fairfax County Public Schools. The vocational and trade initiatives began in the county 1970. But as computers became the focus, auto and other trade classes started to decline. "We saw a boom or a focus switch in the '90s to the IT world," Maclin said. Given where many of the jobs are today, mechanical skills are back on the rise. "There's definitely a shortage of automotive mechanics in the Washington region and nationally," Maclin added. And it's not just young men taking part in the program. "I don't want to be one of those girls that gets stuck on the side of the street and not know what to do," Corali Rosado said. She's also taking the program to avoid getting scammed or cheated when it comes to getting her car repaired.